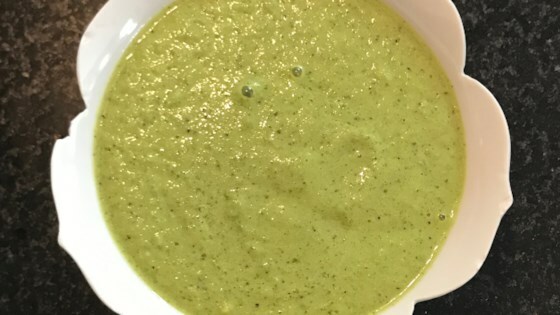 "The spicy green aji sauce from Inka Mama's. This sauce is commonly served with bread as an appetizer, and goes well with almost any Peruvian dish. It is fantastic over rice. Add or remove peppers as needed for your taste. Before removing peppers, remove the seeds and ribs from existing peppers. When adding more olive oil, add no more than 1 teaspoon at a time and wait 30 to 45 seconds between adding more." Combine iceberg lettuce, romaine lettuce, garlic, serrano peppers, and olive oil in the blender; blend until smooth. Season with salt and black pepper. This tasty soup is brimming with meatballs, pasta, and fresh vegetables. This is very close if not equal to Inca Mama's. I halved the recipe on my own and added a tablespoon of cilantro prior to blending, because I love cilantro. Delicious!! It's just as simple, easy, and tasty as advertised, and then some! I love it. This one's keeper! Thank you, Inka Mama! This was fantastic! Tastes exactly like the sauce they serve at our fave Peruvian restaurant. I added a few more cloves of garlic for a bolder taste. Will make this again! Thanks for sharing!